UPDATED: A White House spokesman tells Marine Corps Times that the beer shared by Obama and Meyer was home-brewed there. It’s called White House Honey Blonde Ale. That’s pretty sweet. By now, you’ve seen the photo above. It’s President Obama having a beer yesterday with Dakota Meyer, who will become today the first living Marine in 38 years to receive the Medal of Honor. The idea was reportedly Dakota’s. When the president’s staff called Meyer over the weekend in advance of today’s ceremony, the Marine asked if he could have a beer with Obama, White House press secretary Jay Carney said in a tweet last night. The president invited Meyer yesterday. 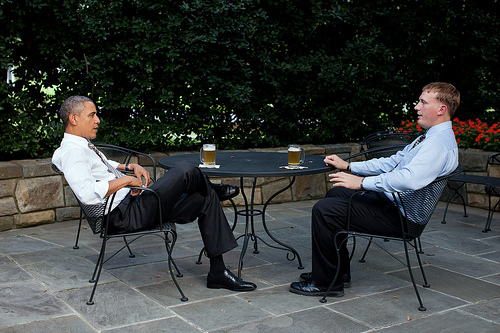 During the Beer Summit in 2009, the guests drank Red Stripe and Blue Moon, while the president had Bud Lite. Based on the photograph, it appears they may have had Bud Lite yesterday, too. I’ve inquired with a few sources to see if we can clear that up. Inquiring minds want to know, and all. That’s a true beer connoisseur who can spot a Bud Lite in a picture such as that. After one, they had to scrape Obama off the patio deck. Truth be told, that Blue Moon is a pretty tasty wheat beer. The rest of us may need to work on our BeerInt. Any president worth his stripes should know that you’ve got to go with a local brew of some kind…not some cheap, corporate sell-out crap like Bud Lite. Update! Got the details on the beer. Do share. Have the recipe by chance? No recipe, but I can say that it’s supposedly made with honey from bees kept at the White House. Don’t think that is Bud Light. Too much head. The White House is brewing it’s own beer. That is White House Homebrew they are drinking.